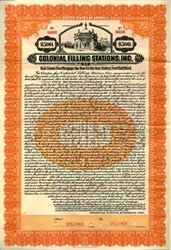 Beautiful engraved Gold Bond Specimen Certificate from the Colonial Filling Stations dated in 1923. This historic document was printed by American Bank Note Company and has an ornate border around it with a vignette of a Colonial Filling Station. This item has the printed signatures of the Company's President and Secretary and is over 96 years old. 20 coupons attached on right side. 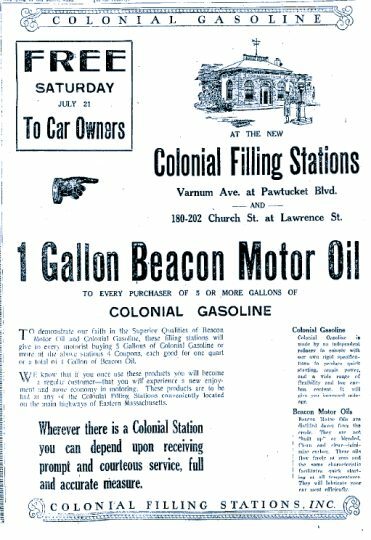 Colonial Filling Stations, Inc. was owned by Beacon Oil Company. The Colonial Beacon Oil Company was formed in 1928 through the merger of the Colonial Oil Company and the Beacon Oil Company. The company was located in Boston and had a extensive network of stations through out New England, Long Island and the eastern edge of upstate New York. In 1931, the Colonial Beacon Oil Company was purchased by the Standard Oil Company of New Jersey and used as their New England outlet for Esso gasoline.